Cattle, or cows, are large mammals. They have been domesticated by people for at least 8,000 years. Hundreds of breeds of cattle exist, providing milk, meat, and help pulling wagons and plows. Some of the cow’s wild bovid ancestors— the Zoo’s American Bison and Musk Ox—still roam the Earth today. Cows eat grasses in pastures or are fed a mix of plants and nutrients. Their 4-part stomachs, allow them to eat these plants that most other animals could never digest. One cow may eat as much as 95 pounds a day. Cattle live wherever people live but are best suited to places with grass for grazing. Different breeds around the world have traits that relate to their surroundings. Brahman cattle in India, for example, have a thin, glossy coat that helps reflect that region’s intense sun and heat. Ayrshires are particularly good at finding food. They come from Scotland, where grazing plants were sparse. Cows spend as much as four out of every six hours eating and chewing. Along with other ruminants, they chew and digest, then re-chew and re-digest their grassy diet. In cows, this re-chewing is called “chewing cud.” Cows chew their cud to get energy from food. There may be more cows on earth right now than at any point in history. But some kinds, or breeds, are very rare. Dutch Belted cattle, for instance, are critically rare, with only a few hundred head in the U.S. The Zoo’s dairy herd includes Dutch Belted cattle to ensure that such rare breeds survive. Weight: Cows 900-2,000 lbs. Bulls up to 3,000 lbs. The Wells Fargo Family Farm includes a small herd of dairy cattle, or cows raised to produce milk. These cows range from large black-and-white spotted Holsteins to small brown Jerseys. When the farm is open, visitors are invited to watch the cows being milked during three demonstrations daily in the Milking Parlor. The Wells Fargo Family Farm exhibits a range of breeds, from rare to common. These may change somewhat from year to year but generally include Ayrshire, Brown Swiss, Dutch Belted, Holstein, and Jersey. Be on the lookout for the Zoo’s rare Dutch Belted. Part of the Zoo’s commitment to nurturing rare animals. The Zoo’s cattle live in the Dairy Barn. The traditional red barn contains cow stalls, a hayloft, and the Milking Parlor. The barn is designed to keep the cows warm during Minnesota’s cold winters. In fact, the Zoo’s herd puts out enough body heat to warm the barn all winter. In summer, fans cool down the cows and keep them comfortable. From outside the stalls, you can pet the animals as they eat from mangers. As long as they stay in their area, the cows have good access to their feed. And their manure—which tends to plop down in a gutter—is easier to clean up! Between feedings and trips to the Milking Parlor, the cows go outside to eat and exercise. In the Milking Parlor, cows are milked 3 times per day. Each milking session lasts about 15 minutes. Visitors are encouraged to visit during milking demonstrations and ask questions of Zoo staff. Along with watching the milking demonstrations, you can also check out the bulk tank. That’s where milk is collected and stored. A milk tanker truck picks up milk every 2 to 3 days. After the milk goes onto the tanker truck, farm staff clean the barn’s bulk tank. They also wash up milking machines and other equipment after each use to keep things clean. The Wells Fargo Family Farm is licensed as a Grade A Dairy Farm. That means the farm can process its raw milk into Grade A milk, cheese, and butter. It also means that the farm meets all state and federal standards. Since the Farm is a working farm, cattle are raised as they are on many Minnesota farms. 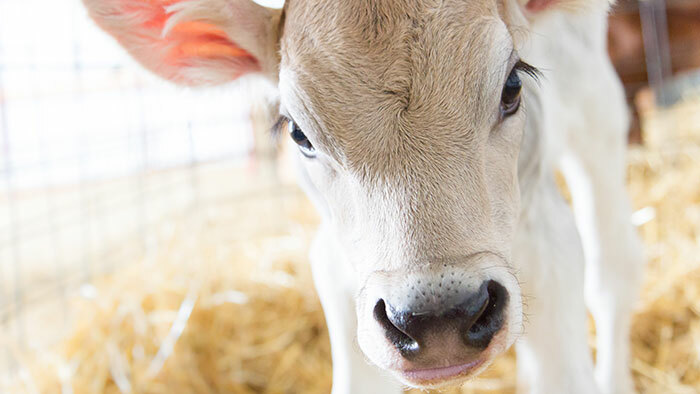 Baby cows, or calves, are born year-round. Their first caregivers are their mothers, who clean them by licking them over with sand-papery tongues. After that clean-up, calves are shifted to nearby hut until their immune system gets stronger. Staff at the farm feed the calves bottles filled with colostrum This rich milk is produced by the cow for the first 2-3 days. Calves later drink a milk-like supplement. They are weaned—or taken off the bottle in 4 to 6 weeks. Cattle at the Wells Fargo Family Farm are cared for by a range of Zoo staff members. Staff oversee the herd’s feeding and nutrition. They keep the bedding in stalls fresh. They groom each herd member, and they make sure there’s always a good water supply in the Dairy Barn. Farm staff at the Zoo take charge of medical problems. They also carefully watch the health of pregnant females and newborn calves. Not all cattle born at the Zoo become members of the dairy herd. The Wells Fargo Family Farm is a dairy farm, and only females can produce milk. Males are sold. At about 15 months of age, young females (called heifers) are bred so that they become pregnant. Successfully bred cows carry their babies—usually 1 per pregnancy—for about 9 months. After giving birth, the mother cow’s real working life begins. That’s when Zoo staff introduce her to the milking machine. With good care and nutrition, most dairy cows will produce milk for 10 months per year. Milking machines collect milk squirting out from the udder of a female cow. There are about 350 “squirts” in the average gallon. To help their food go down, a typical cow produces 70 to 80 quarts of saliva a day. Here’s one pie you won’t want to eat: When cows produce manure, or waste, the waste often plops down in a round splat on the ground—known as a “cow pie.” This is valuable fertilizer. Cows have no upper front teeth. Although they have a total of 32 teeth, they have none in the middle of the upper jaw. This means cows have to swing their heads to tear grasses up from their roots. 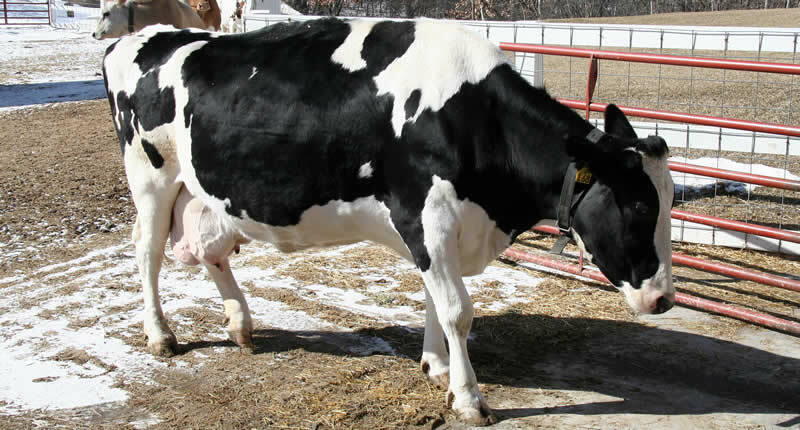 Of all dairy cows, Holsteins produce the most milk. In 2005, Minnesota Holsteins averaged more than 18,000 pounds of milk. That’s about the weight of 5 typical mid-size cars!